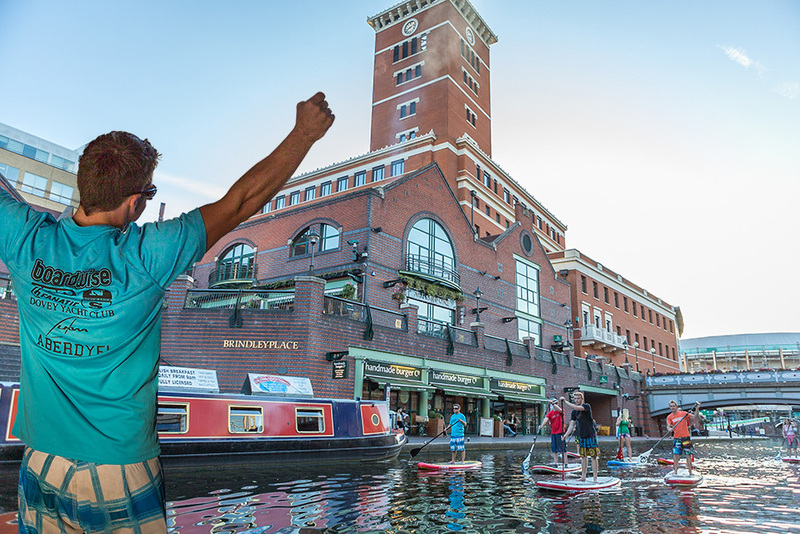 The first sighting of an inner city stand up paddle boarder for me was Midland SUP pioneer Chris Kenyon, Chris regularly paddled at Edgbaston Reservoir in Birmingham and I believe he was one of the first to venture into the city centre down the canals. At the time I was working as a windsurfing instructor for Edgbaston Watersports youth academy. Coming from a windsurfing background I was a little doubtful about the idea of stand up paddle boarding at first, especially on windy days when I would come flying past Chris battling into wind, sneering and telling him he needed to get a sail. 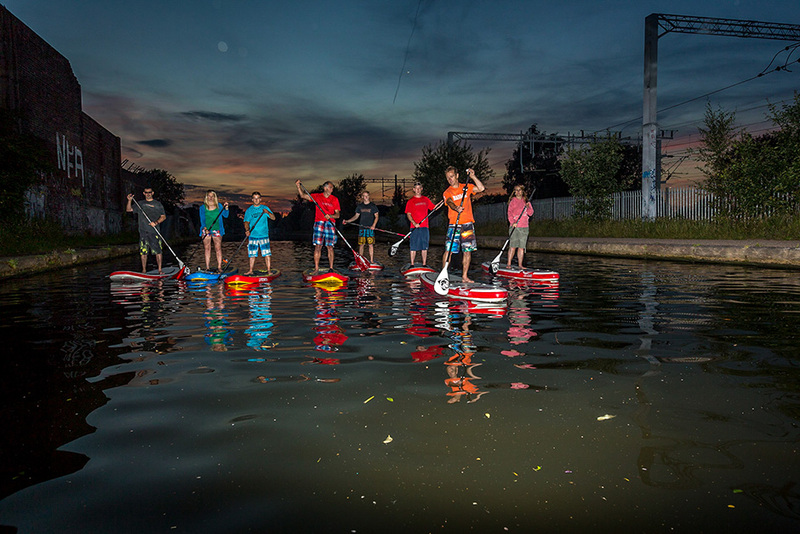 My opinion soon changed after Edgbaston Watersports took delivery of some SUP boards and we started using them with the windsurfing youth academy on windless days. The first thing that struck me is how accessible SUP is, complete beginners can be taught the basics, standing and paddling in minutes. Anyone who has tried windsurfing would agree it’s difficult and the learning curve is much steeper than learning to SUP. 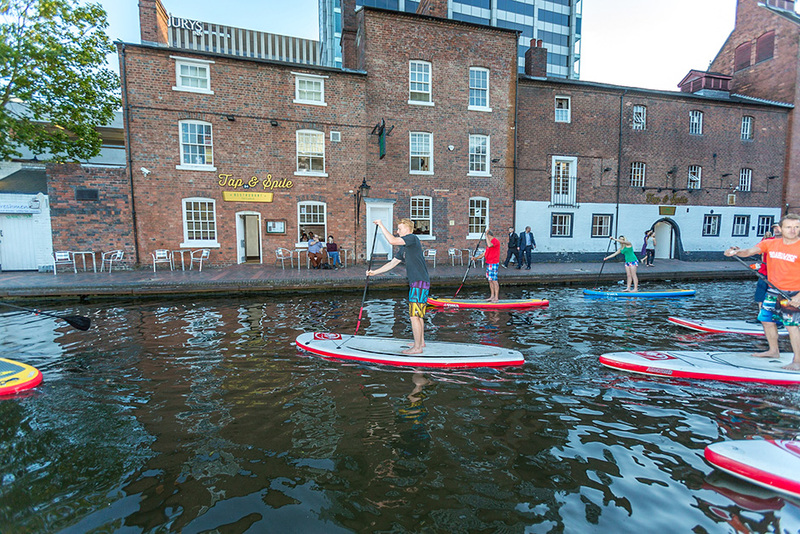 I soon realised SUP was a fantastic way to get people out on the water and enjoying themselves! Keith Wraight later went on to form Inland SUP at Edgbaston Reservoir, a non profit club offering taster sessions, BSUPA level 1 and SUP tours into Birmingham city centre via the canals. 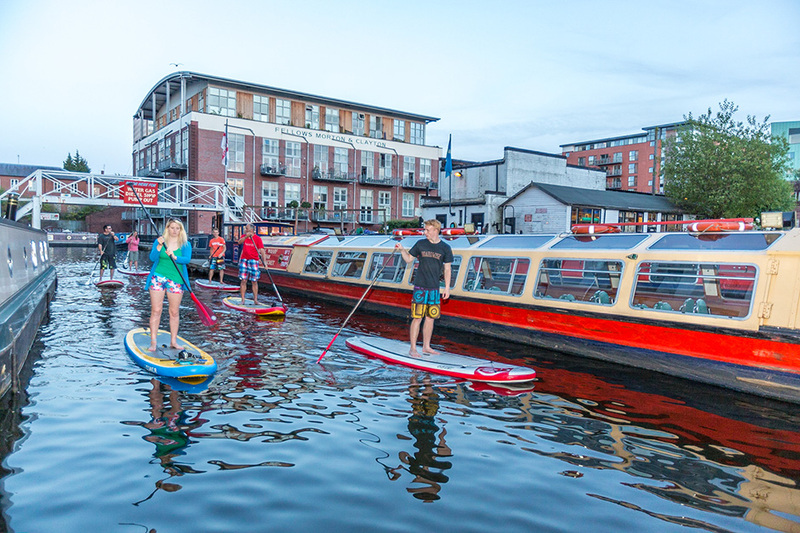 As any Brummie will tell you Birmingham has more miles of canals than Venice, so when the opportunity arose I took my first inner city SUP tour with Keith’s iSUP club. The following summer, I was in Boardwise doing my usual routine of trying to blag Doug Foden for discount on kit I was buying when we started chatting SUP. Doug mentioned that Dave White from RRD was interested in getting some photos of inland SUP spots. The idea of paddling into the city centre had come up and did I know if it was possible or knew someone that could act as guide? Yes and yes! Dave White is a tricky guy to get a meeting with, you only get a day’s notice as he is usually between one of the many demo events he runs throughout the year all across the UK. However, knowing I would get the chance to ride some new RRD demo boards I was more than happy to act as guide. The call came in and we agreed to meet early afternoon the following day, looking forward to the paddle I risked leaving work early only to spend three hours waiting for Dave and the Boardwise crew who where running late after spending all day river SUPing – I do envy these people with flexible jobs, go to work or go out on the water? I know where I would be most of the time! Fast forward to this July, back in Boardwise trying my luck for more discount, another meet was pre-arranged and again the call came in with a day’s notice, Dave White and his toy box full of RRD SUP goodies could do an evening between demo days. Hitting the water on RRD and O’Shea inflatable SUPs, a quick session on Edgbaston Reservoir with Keith’s inland SUP club and a few photos later, we drove the short distance to the canal launching point. Turned out this summer provided much better weather for photo opportunities, a great evening for a paddle and a pint! Head right towards the city. First junction and bridge on the right is Icknield Port Loop, if you still have the energy you can paddle this loop on the way back. Passing through the Ladywood area of Birmingham you will come to St Vincent Street Bridge, here the canalside scenery changes from old industrial to the newer waterside developments. Sherborne Wharf will be the junction to your right as you come under the bridge. Stay left on the main canal passing the NIA and the Sealife centre until you get to Old Turn Junction which has a small circular island in the middle of the canal. Turn right signposted Worcester heading past Brindley Place, the ICC and Symphony Hall. Go under Broad Street Bridge leading into Gas Street Basin. From Gas Street Basin paddle through Worcester Bar Lock which is a small narrow section of water. The big modern building in front is the Cube, as you come towards it there is a small mooring area to the left. This is the Mailbox providing plenty of restaurants and bars for halfway refreshments. Oozells Street Loop, turn left under the bridge after passing Old Turn Junction (the circular island with the signpost). Icknield Port Loop, junction under bridge just before launching point, loop goes past original canal maintenance depot and small rideable weir. Water quality Take a big board as you really do not want to go in the water! Washing your kit afterwards might be advisable. Be prepared for pointing, heckling, questions and having your photo taken – it’s the city centre so there will be lots of people around. Check events the ICC and NIA regularly hold big events meaning thousands of people around the canals, security can be tight and the police might not let you paddle through. If you want a guided tour with all the kit provided or fancy a paddle on the reservoir contact Keith at Edgbaston Watersports. 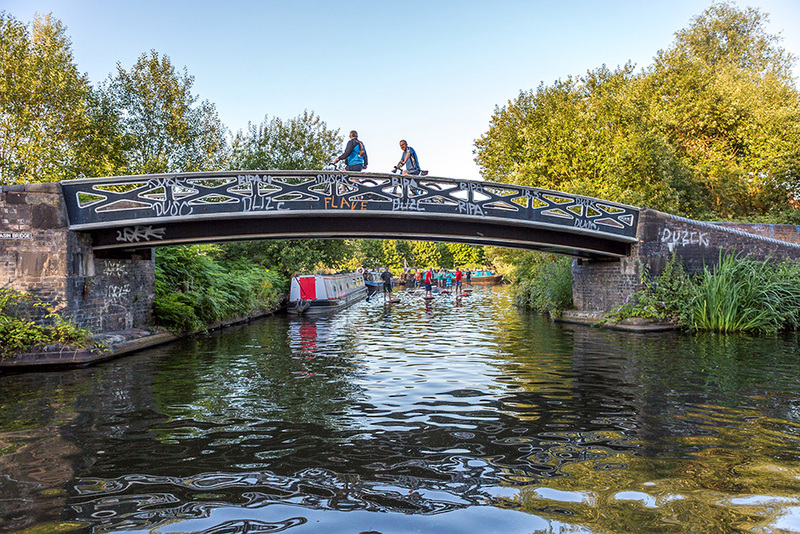 The Birmingham Canal Main Line was originally built by James Brindley and was later updated by Thomas Telford to bring goods in and out of the heart of the industrial revolution. 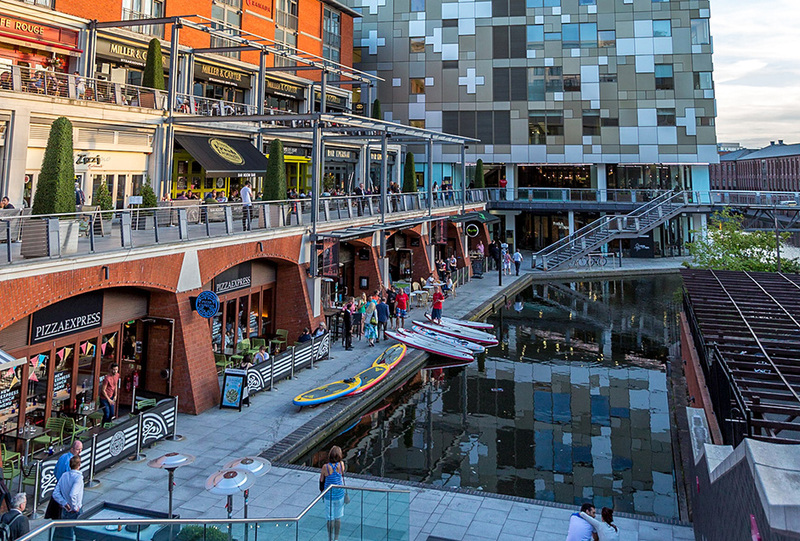 The route takes you through the quiet back waters of old industry into the hustle and bustle of Brindley place down into Gas Street basin and on to the Mailbox right in the middle of Birmingham city centre. The surrounding buildings are rich in history and paddling on the water provides ideal views. The return trip can take in Oozells Street Loop containing Sherborne Wharf, the location of upmarket waterside apartments, and Rotten Park loop, part of Brindley’s original canal. Two to three hours at a steady pace and depending on if you stop for a drink halfway. Rotten Park Road off the B4126 Icknield Port Road, long dead end road with plenty of on street parking and access to the canal at the end. Fairly safe but as with anywhere don’t leave valuables on show. Launch from tow path, canal has walled sides so easy to step on to your board.